Back down on terra firma, a short walk away is “This is Holland“, a multimedia (including scent!) experience of flying over and around the country. You can tell it’s for tourists because the name of the country is “The Netherlands”; “Holland” refers to the provinces of North Holland and South Holland. Calling the country “Holland” is like calling the US “Carolina”. Anyway, they’ve put together some very hi-res video from helicopter flights over and around national landmarks. There’s introductory films on the country’s history and the “flight plan” to prepare you for the main event; the host for those appears to be a cheap kid’s show host / TV comedian. I warmed to him after a while. When you’re done, you exit through a gallery where you can learn a bit more about the places you’ve seen. One cool thing at “This is Holland” is that where you’re waiting in line for admission, the outer wall of the theater is covered with Delft tiles illustrating various historical and cultural things associated with the Netherland’s history. You know those “photomosaics” where they take hundreds of tiny pictures of related items and put them all together to make a big picture of another related item? I think that’s what they’ve done here. I took off my glasses to look at the wall, and there was a windmill generator, and I’d swear that was an offshore drilling platform…. It is well worth the visit; I recommend making the time to do so. You know, it’s easy when you come from a place like New York City or London or Paris to look down on other countries or cities. “That’s the thing they’re bragging about? That’s what they are proud of? Pffft!”. But when you start traveling and paying attention to other peoples and cultures, you come to realize that EVERY country, no matter its size, is rightly proud of its heritage, excited about their present, and confident for their future. If they’re not, they are doomed. Also in the area are the Eye Film Institue, a museum / theater dedicated to the art of film. I didn’t have the time to visit it. Nor did I bother visiting the Tolhuistuin (Tollhouse Garden – OK, I did stop in the garden in the back to take a breather), a cultural nightspot next to the A’DAM Tower. It was still daytime when I was there, so the place was rather quiet. 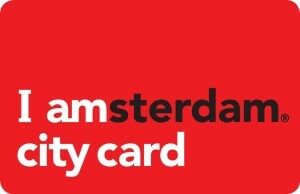 This “IAmsterdam City Card” is a combination tram card, museum ticket, and discount coupon. Yes, it comes with a map and listing of all the places it’s good at. One blogger I came across did the math, and found that it’s not really that much of a bargain at the shorter times. But I figure that the little extra you spend is more than made up for by the convenience of not having to carry around a separate tram card and then fumbling around looking for the right amount of Euros when you are in line for a museum. You really do need to be constantly aware of your surroundings. Especially when there are separate dedicated lanes for bikes, trams, and cars – often with their own traffic signal, often crossing each other, and often without anything separating them. Still a lot more to see in the city that put a dam on the Amstel River, so stay tuned!